Caribbean Callaloo and CJLO invite you to the 3rd annual, all inclusive, special Valentine Dance on Saturday, February 13th. There will be live entertainment by the heartbreaker himself, Mr. Pete Douglas and music by Caribbean Callaloo's own DJ 610, DJ Nigel, DJ Toney, and special guest DJ Néné of CJLO. Musician and CJLO's Grrlz Groove host Emily Brass will be the guest co-host this Saturday night on Suite Delight. Read more about Suite Delight Gets Invaded! Beats From The East Welcomes Taiyo Na! Saturday, February 6's episode of Beats From The East is not to be missed. For those familiar with Asian-American urban music, our guest interviewee needs no introduction...Actor, host, and musician TAIYO NA will be live on the air with DJ Mister Vee! As usual, the show starts at 10pm EST...interview at 11pm EST. Read more about Beats From The East Welcomes Taiyo Na! Check out this week's edition of Sunny Side Up With Adam And Kim! Check out this week's edition of Sunny Side Up With Adam and Kim (February 2nd) at 10:30 as they interview David Siscoe, exercise specialist. He's going to be answering all of your fitness and weight loss questions, so feel free to send in yours via e-mail (sunnysideupcjlo@gmail.com) or Twitter (SunnySideUpCJLO). Read more about Check out this week's edition of Sunny Side Up With Adam And Kim! Get Schooled at CJLO Pub Quiz! Put on your thinking caps and go head to head against CJLO's top DJs at the CJLO Pub Quiz every Monday in February at the Ye Olde Orchard Pub at 1189 De La Montagne. There will be awesome prizes for the winning team and all donations go to support your favorite radio station, CJLO 1690 AM! The fun starts at 8pm and it's also industry night so it'll be happy hour all night long! Woo cheap drinks! Wooo thinking! Read more about Get Schooled at CJLO Pub Quiz! Unabridged will be at a CASE poetry and short story reading on Thursday, January 28th. Make sure to come down and listen to the fantastic authors or read your own material! CJLO's Battle Of The Bands - Click Here for Info! CJLO is getting ready to throw its first ever Battle of the Bands this March! We're looking for Concordia bands to battle it out for a grand prize of studio time to record a demo with a CJLO producer as well as an on air interview and website feature (total value $1,000). The battle of epic proportions will be judged by a panel of CJLO execs and producers and an industry professional to be announced! 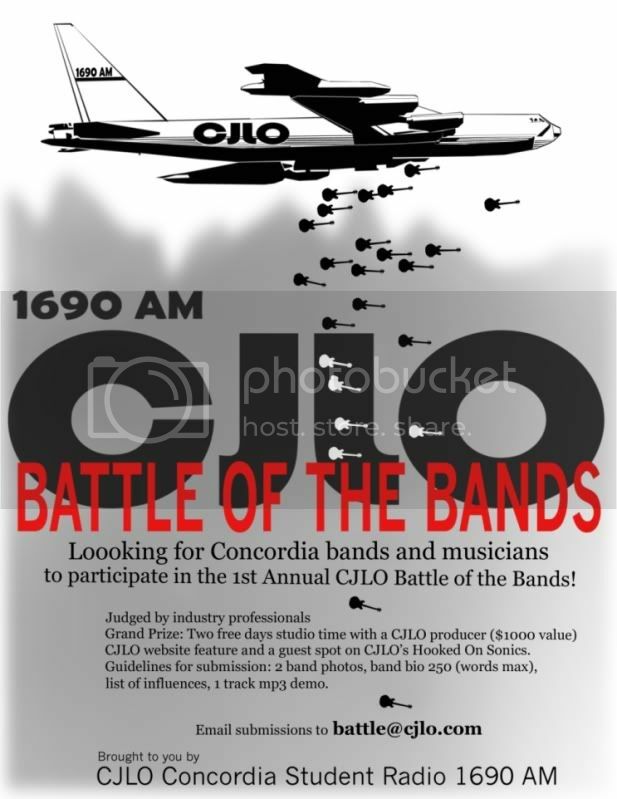 Read more about CJLO's Battle Of The Bands - Click Here for Info! For over five years, Hayti Plus has been a staple Wednesday morning show here at CJLO. The station has always been proud to offer an additional voice to the Haitian community in Montreal and today, in Haiti's time of need, we urge our listeners to help with the relief effort. Go Go Radio Magic Show Live! Join your friends Prince Palu and Uncle Ian as they broadcast their two hour weekly quest for rock n' roll revolution and radio magic revival LIVE! The guys will be spinning all your favorites from Ye Olde Orchard Pub, 1189 De La Montagne in downtown Montreal. Come and actually see the magic happen as we bring radio to you, live from the pub. Read more about Go Go Radio Magic Show Live! CJLO Punk Rock Night at Club Katacombes! 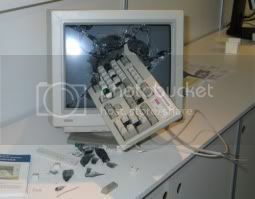 Do you want to punch Thursdays in the face!? Don't miss CJLO's monthly punk rock DJ night at Club Katacombes! Katacombes has moved into a new awesome space at 1635 St Laurent corner Ontario and we'll be there the first Thursday of every month! 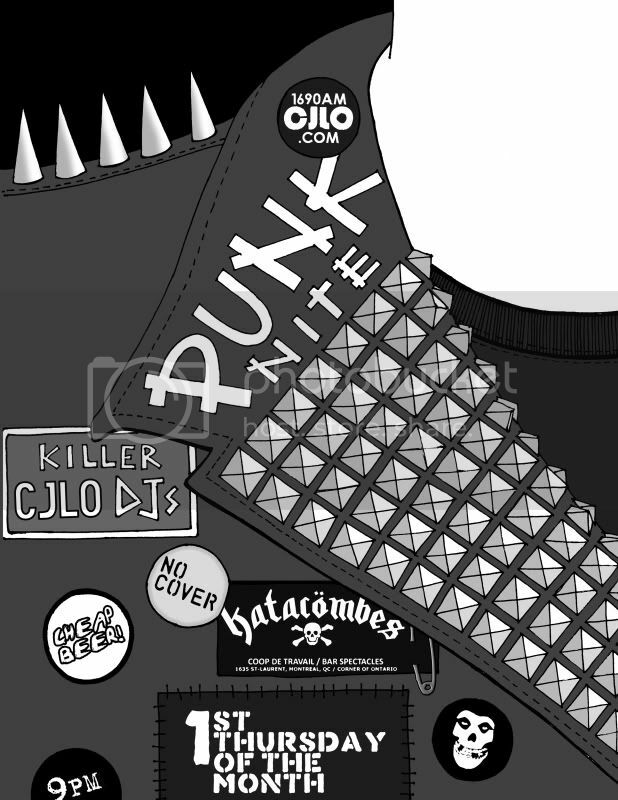 Read more about CJLO Punk Rock Night at Club Katacombes! CJLO Has A Whole New Look! CJLO is very happy to introduce its brand new website. After months of old website troubles, it was time for a whole new look. This website is bigger and better than ever before with a slew of all new features! Read more about CJLO Has A Whole New Look! If you happen to be the type of person that loves both music and short, numerical lists, then boy, do we have something for you! As part of the move to the Brand New CJLO.com, we've started to bring over all of the older magazine articles, incorporating them into the newness. Amongst the first to be migrated are the old year-end Staff Picks lists, representing the favrouite music of CJLO DJs past and present. Check out these lists at http://cjlo.mtset.com/magazine/feature. We've got 5 up here, from 2004 straight through to 2008. Can you guess what bands and albums will make the cut for the 2009 Staff Picks? Challenge issued!